Putting together the various pieces of an IoT system is like assembling a jigsaw puzzle. But it's a finite task that most engineers can get through. When it comes to the operating system, other runtime software and the development tools available, here are seemingly endless possibilities. Hence, on Day 3 of this three-day class, we'll help you figure out what software is needed for your system, where you can find that software, how you can evaluate the software, what tools are available to help assemble the pieces and build your applications, and how to test it after it's been deployed. Day 3 sponsored by Intel. In our first two classes, we have looked at the needs of a cloud-based IoT solution and how to design and build it. In this final class our expert instructor will cover the critical aspects of how to test and deploy our IoT solution, and more importantly, how to keep it secure and operational through ongoing monitoring and maintenance. We will look at how Device Cloud enables ongoing monitoring and maintenance for the devices through the entire life cycle of the IoT solution from design through end-of life. Particular elements to be covered will include Device Cloud functionality such as edge management and data management. Still in its relative infancy, the IoT is already being hacked at an alarming rate. We need to include the tools and the platform to stay one step ahead, keep our devices secure and up-to-date, and maintain a vigilant ‘eye’ on the system throughout its life. Sponsored by Wind River. As we learned in our first class, we need a cohesive platform of tools and various ‘building blocks’ to build a robust cloud-based IoT solution to meet the needs of even high-reliability IIoT applications. In this second class on cloud-based design for the IoT, our expert instructor will discuss how a combination of Industrial Internet of Things (IIoT) technologies and software-defined architecture (SDA) from Wind River® is ushering in a new era of IoT innovation. Some of the topics to be covered include development tools and example pre-build platforms for many popular targets, connectivity and control APIs, and network and infrastructure platforms and services. Our instructor will also cover the topics of how to assure our communications and data are secure and properly communicated, filtered, collected, and safely stored. Current industry estimates are that only 10-25% of data is actually collected and stored – when this data increases by perhaps two orders of magnitude in the next five years, how can we assure that we can indeed collecting, communicating, using, and saving the data we need? We will look at some of the answers to that question in this class. Sponsored by Wind River. Before we begin our IoT system solution, we need to fully understand the overall structure and key elements of a robust and secure cloud-based system. In this leadoff class, our expert instructor will review these needs as well as the possible challenges that we face and will continue to face in our IoT system throughout its life cycle. We will review the basics of designing for the IoT as well as the primary elements that are needed in its design. Issues to be covered include safety, security, device management, data management, network communications and infrastructure, and maintenance. We will look at Wind River Helix Device Cloud, a SaaS IoT device management platform, and how its ready-built elements can be integrated into our IoT design. Sponsored by Wind River. With the connection to the Internet and the connectivity to a plethora of devices, cybersecurity is a big issue. This dovetails with the need for multiple levels of safety that were discussed in Day 2, as it pertains to the cost of certification in critical infrastructure IoT. While this may sound like a complex endeavor, it doesn’t have to be. Attend Day 3 of this three-day course, and we’ll make sure that you’re headed in the right direction. We will show you how your IoT applications can be made secure and updated with critical cybersecurity patches while at the same time your safe and certified critical infrastructure applications remain untouched. In addition, we’ll provide a wrap-up of the three days and be sure to answer any outstanding questions. Sponsored by Wind River. Companies are updating their critical infrastructure, and safety has become a key issue, with increased regulation and risk of litigation driving the need for safety certification in industries such as aerospace, energy, industrial automation, medical, and robotics. One area of concern is partitioning safety certified and non-safe code and that’s what we’ll cover in Day 2 of this three-day course. We’ll look at how using virtualization, Java, analytics and various types of partitioning in your IoT design can maximize safety and reduce your overall design cost and risk. Sponsored by Wind River. There’s no way around it; as a software developer, system engineer, or system architect, you’re going to encounter design complexity when developing safe, secure and reliable IoT systems for today’s critical infrastructure. But in this new software-defined world and with the IoT exploding around us, companies like yours must adapt to stay relevant. While legacy critical infrastructure is too expensive to just replace completely, there are ways to implement new features that will define premium products for your market and meet the safety and security requirements necessary for connecting to the IoT. In Day 1 of this three-day class, we’ll look at how you can transform digitally and ensure that your applications remain safe and secure. Sponsored by Wind River. Recent events have proven that you can never be too careful when you’re designing batteries into your systems, and that covers everything from wearables to hybrid/EV battery packs. In Day 1 of this three-day class, we’ll look at how to make your battery packs safer; how to build a USB-to-controller interface that “talks” to a power device; and how to extend battery life in wearable devices. The class concludes with a question and answer period between the attendees and the expert instructor. Day 1 sponsored by Intersil. While we can't build your complete system, we can take you through some of the key stages that'll put you well on the way toward finishing your design. In Day 2 of this three-day class, we'll look at the common subsystems with an IoT edge device and what you need to know to connect to the Fog and the Cloud. We'll also show you what some of the typical hurdles/stumbling blocks are, and most importantly, we'll show you how to navigate that slippery slope using an Intel Atom processor as our design example. Day 2 sponsored by Intel. All processors are the same, right? Well, not exactly. In fact, they vary greatly in terms of price, performance, power consumption, and a host of other features that can make or break your design. 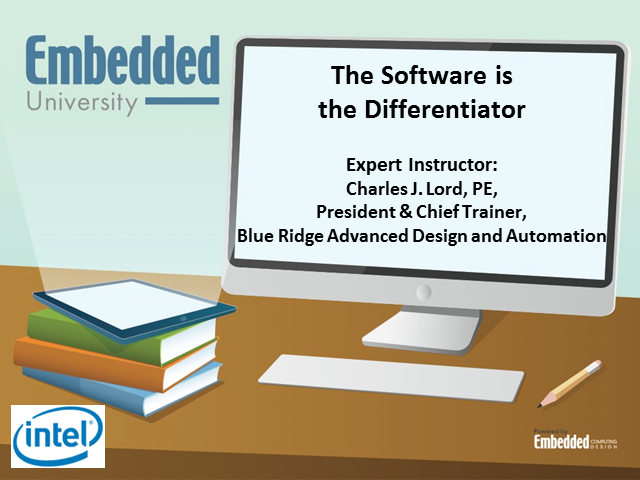 In Day 1 of this three-part class, we will go over different design requirements and where the Intel Atom processor fits. Then we'll get into the feature set that's best for your specific IoT application: performance, security, media processing, image processing, time coordinated, computing, etc. Day 1 sponsored by Intel. Class 3 will delve into mitigating software supply-chain risk by implementing a thorough security audit process of one’s software, which has become more critical as more code is being “leveraged” as opposed to written. We will discuss potential risks of leveraged code: previously trusted legacy code, commercial third-party code, and open-source code. We will discuss binary analysis technologies for efficiently assessing risk. This need is growing as too often this code isn’t properly tested, especially with the specific target hardware. The instructor will be covering both the technical aspects and the process that should be followed, with special attention paid to software that’s written for the IoT. Day 3 sponsored by GrammaTech. Class 2 will be a follow-on topic to class 1, where we will discuss the concept of concurrency. It’s clear that today’s developers need to be designing more efficient and higher performing applications using multi-threading, and testers need to understand how to efficiently pinpoint potential race conditions caused by concurrency defects that will lead to system failure. This is especially true when it comes to programming for multicore processors. Within the class, we will provide key insights and techniques for identifying concurrency defects, key to quality and safety, particularly as it pertains to the Internet of Things (IoT). Day 2 sponsored by GrammaTech. In this class, we will teach software developers, testers, and analysts how taint analysis can identify exploitable areas within an application and/or system that could be used as an entry point by a hacker. Using IoT as our example, we will help perform proper taint analysis, evaluating how data modified purposely by a user or system (such as a variable set by a field in a web form or a package of information send across an automotive CAN bus) poses a potential security risk. With the continuing surge in code and data spawned by the IoT’s popularity, this is especially needed to maximize security and maintain an efficient data flow, regardless of whether it’s data within an application or data that’s transferred between applications. Given the enormous increase in application and system connectivity, all software should be analyzed for taint defects. Day 1 sponsored by GrammaTech. Educational events hosted by industry experts. Educational events hosted by industry experts, brought to you by OpenSystems Media.